John Byrne is a rebel. Instead of joining the quest as the most eligible nominee from the Glasgow School of Art, where he graduated, for the Turner Prize, John embraces portrait, the subject matter modernist artists turned their back on. The reason? John likes to explore complex beings: “I am the most complex person I know.” So it’s not surprising to see many of his self-portraits in Sitting Ducks. Opening up oneself is a brave and risky business. John Bryne’s self-explored complexity invokes a strong desire to reach out and yet a determination to stay private, with sideway-look and tight lips denoting a hint of uneasiness and reservedness. One of the very few self-portraits with a direct gaze at the viewer is Self-portrait in White, where his look is hesitant, as if pleading for mercy of understanding. The ample space in the painting also ensures a distance between him and the viewer. This “sitting duck” vulnerability is equally emulated in the portraits of others: his wife, children, lover Tilda Swinton and co-workers in the theatre world where he fleshed out his other talent as a playwright. After the portraits in oil, inside another dimmer room there are smaller sketches mostly of his children. Displayed here in the corner is a letter addressed simply “Magritte, France” from John Bryne to the famous surrealist painter René Magritte, whom he admired. 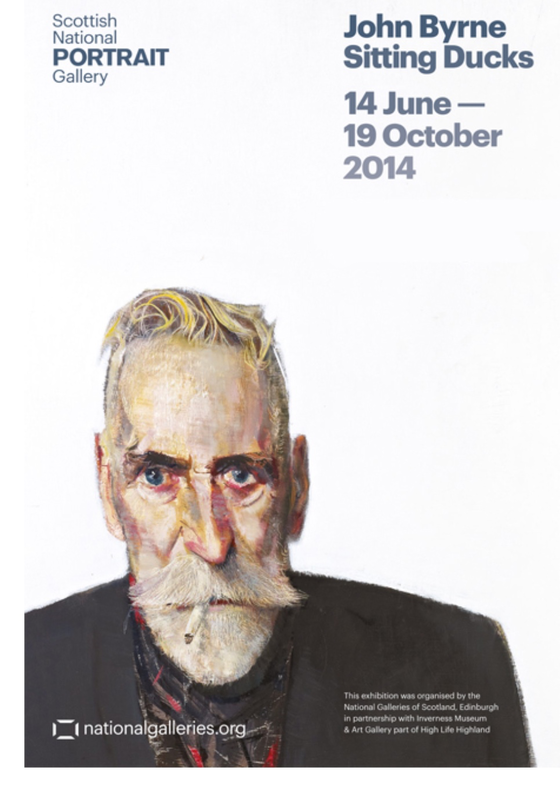 Intimate, enigmatic and at times humourous, Sitting Ducks offers an open and generous passage into the sensitive heart of a gifted John Byrne, whose style is as complex as his self.